Social media management is complex. The contact center handles customer engagement, and the marketing department creates promotions to drive traffic. Each department has their place, and never the two shall meet. There’s a wasted opportunity here. By coordinating, collaborating, and combining your efforts, the marketing department and the contact center can accomplish what neither can do alone. In this ebook, we provide the concepts and insight necessary to competently manage the customer service side of social media while also discussing ways to leverage the skills of the marketing department. Combined, your organization can utilize the full power of a comprehensive social media strategy. 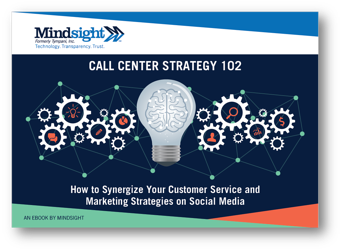 Get your free copy of Call Center Strategy 102: How to Synergize Your Customer Service and Marketing Strategies on Social Media today.